Have you ever been asked to create curriculum when you felt like your primary focus should be teaching? In an effort to save money, we have heard some districts are having teachers work collaboratively to design daily lessons for the Common Core. This poses a problem. When are teachers going to find time to create top notch Common Core lessons when they are in classrooms every day? There are two ways districts think they are saving money. One is they are trying to find free Common Core material for their teachers to use. The other is they are asking their teachers to be curriculum creators. 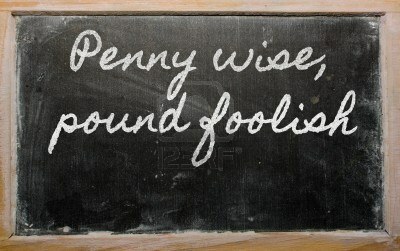 Now don’t be penny wise and pound foolish. Districts might save a little money now, only to waste large amounts later on when they realize their plan to save money backfired. Read on to hear my opinions on why I believe districts should make curriculum decisions with their eyes wide open. Upon further investigation into why a prestigious Michigan district did not choose WriteSteps, we uncovered the truth that the district went with a “free” resource. Arlynn King, WriteSteps’ Curriculum Creator and PD Coach, looked into the Michigan Association of Intermediate School Administrators (MAISA) CCSS Units they went with. MAISA CCSS Units are an example of a consortium of school districts currently working to create writing units adhered to the Common Core Standards. Arlynn discovered that like with many things, when you take out the “R” in FREE, you get FEE. The supposedly “free” writing units offered to schools ask teachers to have the full version of Lucy Calkins in order to teach the complete MAISA lesson plans. Therefore, if teachers do not have Lucy Calkins, they will have to take the time to create the lessons themselves. It’s like when your kids open their Christmas presents and are so excited to use them, only to discover you forgot to buy the AAA batteries! Collaboration among teachers to create lessons involves a lot of work. Different viewpoints are great, but I spent a lot of my time explaining why I chose a certain style of lesson to other teachers, and vice versa. The variety of different teaching styles and opinions represented in the new lessons disrupted the flow and consistency for students. I believe elementary teachers are taken advantage of. As a teacher I was a generalist and taught all the subjects. But, I think administrators assume we are specialists in all subjects. If a teacher agrees to be a curriculum creator for writing, will they also be asked to be curriculum creators for math, reading, spelling, science, and social studies? While I was meeting, planning and creating, I couldn’t give my best to my students. Let’s be honest. Some teachers love creating lessons and can whip up great lessons in no time! But what about the teacher that finds the process difficult and time consuming? Compiling and creating lesson plans takes a lot of work. I know because it took me years of research and planning to create all of the lesson plans that were included in the original WriteSteps. The time went by in a snap because of my passion for teaching writing. However, not all teachers want to spend countless hours outside of the classroom perfecting lessons on a subject they may not particularly be passionate about. Many teachers originally decided on their career paths because they are passionate about TEACHING, not creating lesson plans. The moral of this story is look before you leap! “Free” will most likely always equal fee in the end, whether it be a fee of money or a fee of time. If you try a free program, chances are you’re going to waste a year and discover that “free” really isn’t free, and you will be hunting for a different solution. Likewise, asking teachers to develop lesson plans to meet the Common Core Standards hurts their effectiveness to do what they do best, teach! With WriteSteps, teachers do not need to wonder if they are using the correct curriculum; it’s all there for them in the daily lesson plans that are provided. Teachers won’t have to struggle or stress about time when it comes to creating writing lessons mapped to meet the Common Core. We aren’t free, but you will get more than what you paid for – confident writing teachers and strong student writers. WriteSteps was recently nominated for a Bammy EdTech Award. This is a huge honor and we need your help! Want to change a child’s future? If you haven’t done so already, help spread the word by voting for us! Please take two minutes to vote for WriteSteps. A supportive classroom environment is the key to success for all of your students. Do you agree with this quote? 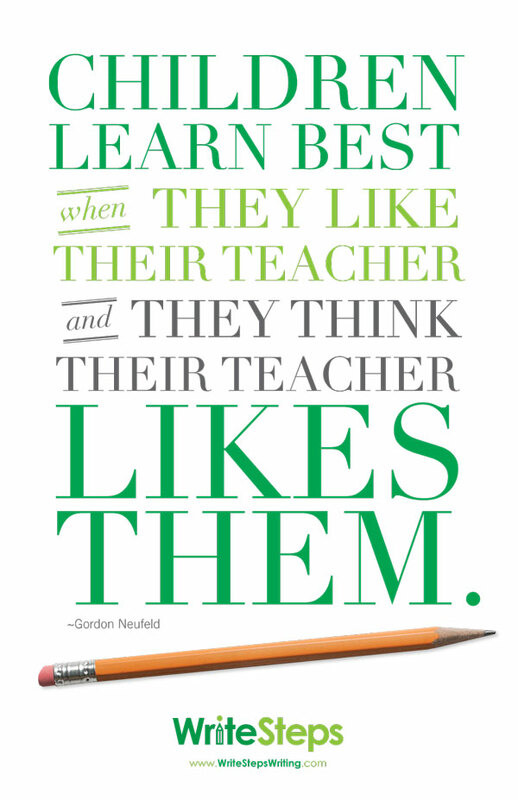 Hang the poster in your classroom to show your students that you care. Meet our new Professional Development Coach! Congratulations to Emily Duffy, who was recently hired as our Professional Development Coach and TeacherStar Coordinator. We’re thrilled to have her join our team. Emily has a Master’s in Education from the University of Pittsburgh along with 12 years of elementary teaching experience. She also provided professional development to teachers in the areas of reading, writing, and language arts as a Literacy Coach. 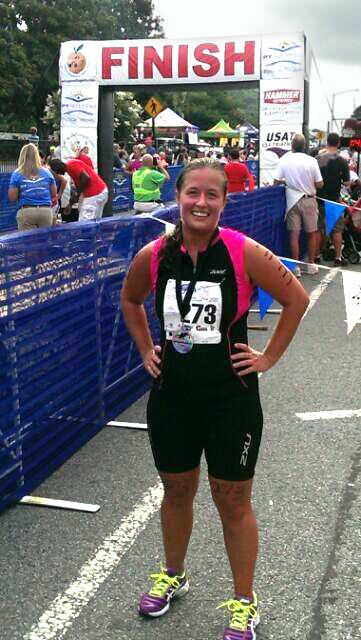 In her spare time, Emily enjoys participating in races (triathlons, half marathons, and she completed one full marathon), biking, swimming, spending time with her four nephews and niece, traveling anywhere new, watching sports (Go Steelers, Penguins, and Pirates!) and reading. Want to learn more about our Common Core writing and grammar program? Jerry Sudden-Loth will be exhibiting at our booth at the Staff Development for Educators Conference, located at the Ernest N. Morial Convention Center. He’d love to talk to you about how we can help improve writing at your school! Kresta Byington will be exhibiting in her home state of Washington at the Washington Association of School Administrators Conference, located at the Spokane Convention Center. Stop by our booth to learn how we provide students and K-5 educators with all of the tools they need to become effective writers and teachers in the 21st century. Kim and Terry Gates will be in fabulous Las Vegas at the National Charter School Conference. WriteSteps will be a booth #1713 in Mandalay Bay. We look forward to seeing you there!